Shamash-shum-ukin (Assyrian: 𒁹𒀭𒄑𒉢𒈬𒄀𒈾 Šamaš-šuma-ukin "Shamash has established an heir") was the Assyrian king of Babylon from 667–648 BC. He was the second son of the Assyrian king Esarhaddon. His elder brother, crown prince Sîn-apla-iddina had died in 672, and in his stead the third son Ashurbanipal was invested as crown prince and later king of Assyria, while Shamash-shum-ukin remained crown prince of Babylonia. This arrangement caused some dissension, and at least one civil servant wrote the King warning against it. Provincial governors and vassals had to take an oath to accept this and to help the brothers gain their respective thrones in the event of Esarhaddon's death. 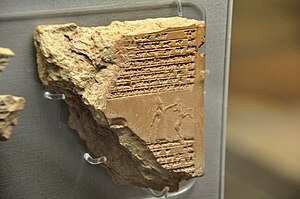 When Esarhaddon unexpectedly died on a campaign against rebellious Egypt in 669, it was only the decisive action of his grandmother Naqi'a-Zakutu, widow of his grandfather Sennacherib and mother of his late father, that got Ashurbanipal on the throne, in the face of opposition by court officials and parts of the priesthood. Shamash-shum-ukin, the older brother, became viceroy of Babylonia. The arrangement was evidently intended to flatter the Babylonians by giving them once more the semblance of independence. In 668 BC Shamash-shum-ukin brought the statue of Marduk back to Babylon. The following year at the New Year's Day ritual, he took the hand of Bēl and became the legitimate king of Babylon. The Babylonian territory consisted of Babylon, Borsippa, Kutha and Sippar. As overlord, Ashurbanipal continued to offer royal sacrifices in these cities. While Shamash-shum-ukin was the sovereign ruler of the south in theory, Assyria maintained a garrison in Nippur, and some of the provincial governors tried to get into Assyrian favour. Letters by Sin-balassu-iqbi, governor of Ur show how he tried to ingratiate himself with Ashurbanipal. Ashurbanipal retained responsibility for Babylonia's defense and foreign policy; Shamash-shum-ukin handled economic matters and land tenure. Ashurbanipal took an active part in the restoration of sanctuaries in the south. A stela now in London commemorates his help in restoring the temple Esagila; another tells of how he restored the Nabu-temple in Borsippa. Even the Sumerian language was revived as the official tongue. For some time this worked well, however Shamash-shum-ukin became infused with Babylonian nationalism, and claimed that it was he rather than his younger brother that was the successor of the Mesopotamian monarchs whose empire stretched from Iran to the Mediterranean and from the Caucasus to Arabia and north Africa. In May 652 BC, Shamash-shum-ukin rose in rebellion. He formed a powerful coalition including Nabu-bel-shumate, king of the Mesopotamian Sealands, the Elamites, the Chaldean tribes of the South, the kings of Guti, Amurru and Meluhha and the Arabs from Arabia. After two years Babylon and Borsippa were besieged, and Elam was defeated and destroyed. Babylon yielded in June 648. A fragment of the annals of Ashurbanipal excavated at Nimrud says that Shamash-shum-ukin was wounded by an arrow. Another account says that he threw himself into his burning palace as Babylon fell to Assyrian troops, to be remembered by the Greeks in the story of Sardanapalus (or Sardanapalos, his Greek name) (Ashurbanipal). However, since after his brother's death, Ashurbanipal reviewed Shamash-shum-ukin's property, including vehicles, horses, furniture, and retainers, J.D.A. MacGinnis regards the account of a grand conflagration as "pure fantasy". 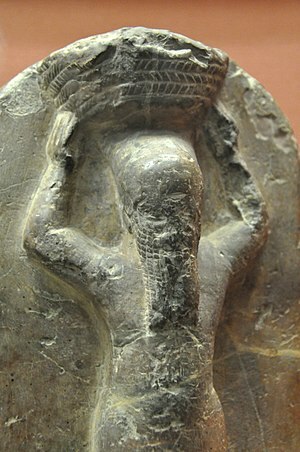 His successor on the throne of Babylon was Kandalanu (647–627 BC). Kandalanu, however, may have been either a throne name taken by Ashurbanipal himself or an Assyrian puppet ruler. MacGinnis believes that details of the siege of Babylon were later incorporated into Ctesias' account of the siege of Nineveh. ↑ "ribo/qpn/Šamaš-šuma-ukin[king of Babylon]". oracc.museum.upenn.edu. Retrieved 2018-03-16. ↑ Frahm, Eckart. "Observations on the Name and Age of Sargon II and on Some Patterns of Assyrian Royal Onomastics" (PDF). NABU. 2005.2: 46–50.